Although the majority of known planets orbit single stars, astronomers have growing evidence that planets in multiple star systems might be just as common as planets around single stars. Kepler-16 (dubbed Tatooine), Kepler-34, and Kepler-35 might be only the first examples of a large class of objects. Finding planets around binary stars is tricky, but the Kepler team is developing machinery to improve the efficiency of detecting planets orbiting one or both stars in binary systems. Stay tuned for more discoveries as the Kepler mission continues! Now that we have proof that planets can exist in binary star systems, theorists are eager to explain how such planets could form and survive. 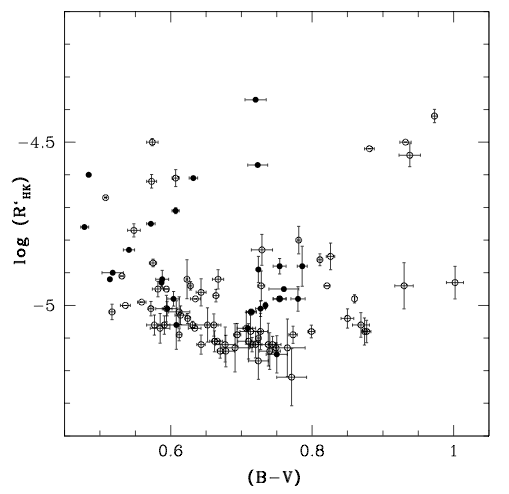 In this paper, Kratter & Perets investigate the long-term fate of planets in binary star systems after one of the stars evolves off the main sequence. They were eager to address the question of whether a planet could survive in such a dynamic environment or whether it would be swallowed up by the bloated star. Kratter & Perets begin all of their simulations with a single planet orbiting a 2 solar mass evolved star in a binary system with a main sequence star. They vary the mass of the companion star between 0.5 and 1.7 solar masses and the binary separation between 75 and 105 AU. The planet orbits the primary star at a distance of 15 AU, so it has a stable initial configuration. Once the 2 solar mass primary star evolves off the main sequence and reaches the asymptotic giant branch, it begins to rapidly lose mass due to strong stellar winds. The orbital distance of the planet is governed by the mass of the primary star, so the planet moves outward as the primary star loses mass. At the same time, the “stability boundary” (the maximum orbital separation at which the planet can orbit without being disrupted by the other star) decreases because the primary star is becoming less massive. Once the distance between the planet and the primary star exceeds the stability boundary, the planet orbit becomes unstable. The orbit then evolves chaotically and the planet can either collide with one of the stars or enter orbit around the secondary star. None of the planets in this set of models escaped the system, but planets could escape from evolving binary systems if the primary star is initially much more massive the secondary. In over 90% of the simulations, the planet orbiting the evolved star was either destroyed in a collision with one of the stars or ended up in orbit around the secondary. 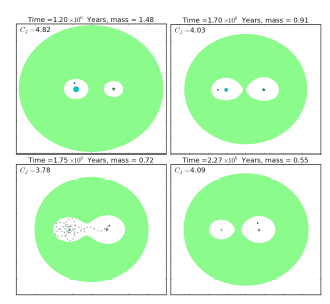 The figure below depicts a model run in which a planet ended up orbiting the secondary star. In all four panels, the white regions indicate where the planet is allowed to orbit. Initially, the planet is in orbit around the primary star and the allowed orbital regions around the two stars are separate. As time passes and the primary star loses mass, the allowed regions (determined by the evolution of the Jacobi constant) expand and merge to form a continuous zone encompassing both stars. At this time, the planet can “hop” between the two stars on a chaotic orbit (indicated by the dashed lines in the bottom left panel). Depending on the duration of mass loss, the allowed region may remain “open” or separate again into two distinct regions around each star. In this example, the planet remains stuck around the secondary star at the end of the mass loss phase. A movie of the simulation is available on Dr. Kratter’s webpage. Four snapshots of the evolution of a binary star system. The white regions mark the allowed regions where the planet (black dot) is may orbit, the green star represents the main-sequence secondary, and the cyan dot represents the primary star. The dashed line in the lower left panel indicates the chaotic orbit of the planet. At the end of the simulation, the planet is stuck orbiting the secondary. Figure 2 from Kratter & Perets 2012. The relative likelihood of collision, tidal interaction, or star hopping depends on the initial mass ratio of the stars and the binary separation. 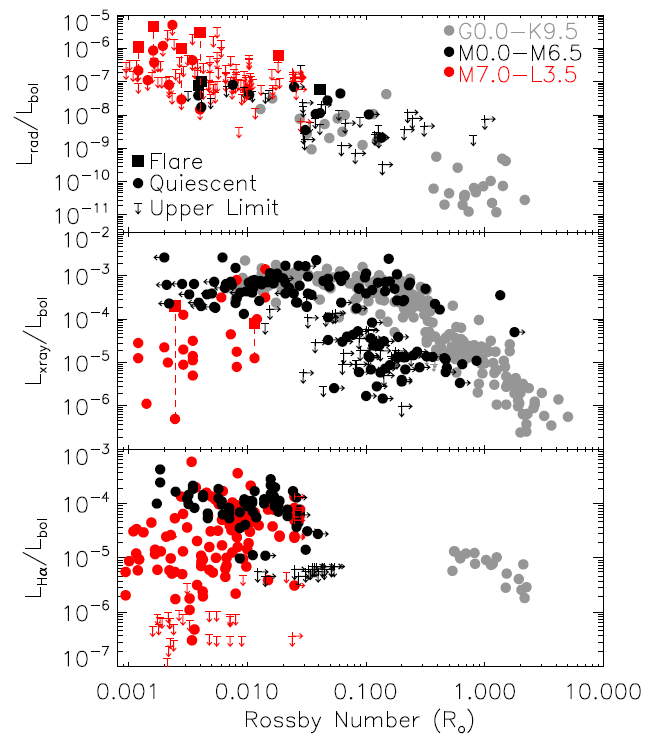 Kratter and Perets find that roughly 10% of the planets star hop to the secondary star in model runs at larger separations and higher stellar masses. This relatively high survival rate agrees well with current estimates of the occurrence rate of planets in binary systems and predicts that planets might be found in white dwarf-main sequence star binaries or white dwarf-white dwarf binaries.